In a recent study, published in The Lancet Oncology, the Fuse endoscope found 69% more pre-cancerous lesions than the standard, forward-viewing colonoscopes. Finding and treating more adenomas means that we can bring a higher quality of care to our patients by potentially reducing the risk of colorectal cancer. While colonoscopy exams prevent many colon cancer deaths and are considered the most sensitive method for detection, colorectal cancer is still the third leading cause of cancer-related deaths in the United States when men and women are considered separately, and the second leading cause when both sexes are combined. It is expected to cause about 50,830 deaths during 2013. At The GI Guy, we are doing what we can to decrease that number. Kurt Vernon, MD, known as “The GI Guy”, is now offering a new type of endoscope that will detect a significantly higher number of potentially pre-cancerous lesions (adenomas) during a colonoscopy. The new endoscope we are using is called Fuse™ and greatly reduces the number of pre-cancerous lesions missed by standard, forward-viewing endoscopes. In fact, a recent multi-clinical trial in the US, Europe and Israel, showed standard, forward-viewing endoscopes missed 41% of pre-cancerous lesions, or adenomas, while the Fuse system missed just 7%. After 28 adenomas were found using standard, forward-viewing endoscopes, another 20 were found by Fuse. In the end, Fuse had an incremental find rate of 69% over what standard, forward-viewing endoscopes found. The results of this study were recently released in The Lancet Oncology. 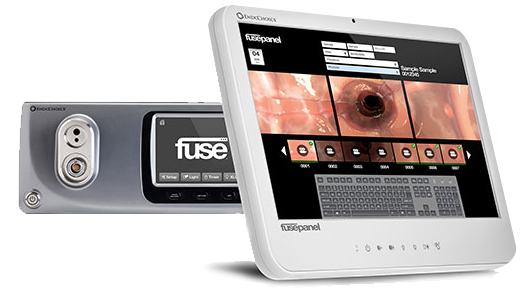 Fuse is unique in that it gives endoscopists a wide, 330 degree view, while standard, forward-viewing endoscopes only provide up to 170 degrees of forward vision. Fuse overcomes the limitations of standard, forward-viewing endoscopes and allows endoscopists to see almost twice the anatomy, thus detecting a higher number of potentially pre-cancerous lesions.